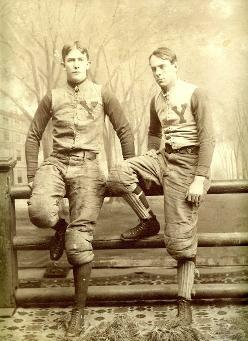 This site is a virtual museum dedicated to 4x All-American Frank Hinkey and the 1890s Yale football teams. During Hinkey's four year reign as left end for the Bulldogs Yale had a 52-1 record, outscoring their opponents 1,730 to 25. He was later named on countless All-Time All-American teams with many considering him the greatest football player of the 19th century. Here you will find an in-depth biography along with unique sports memorabilia and photographs, many once belonging to Hinkey and/or his teammates. This site is regularly updated as new information is discovered. A special thanks to the Hinkey family, Eleanor McCree and Will Conroy. Without their support and advice this site wouldn't be possible. Last Updated: March 10, 2019 - View "The Games" link for 1894 Yale vs Princeton Football Memorabilia. Check out Photo Album for more photos.